Universal Basic Income is one of several ideas floating around for dealing with the income/opportunity gap. Since you seem to be interested, I’m passing to you a briefing paper that my research team prepared for me and that I tweaked based on my Q&A with them. I won’t give you my conclusions because I don’t want to bias you. I’d rather you form your own opinion after you are informed. UBI isn’t an especially new idea; even Thomas Paine was an advocate. The idea gained traction and elicited debate in late 1960s (especially during the Nixon administration), but never really gained a foothold. Where is UBI Receiving Policy Interest? Cities in Canada, Finland, the Netherlands, and the US have announced pilot schemes to test the effects of the policy (generally, these are in very early stages). Governments in Germany, France, New Zealand, India, Scotland and Namibia have also expressed interest. GiveDirectly (a charity that distributes cash to the poor) has launched a comprehensive study on unconditional cash transfers in Kenya. Most notably, Switzerland held a referendum on UBI in 2016, proposing each citizen receive a monthly income of about $2700. The proposal was defeated (77% of voters opposed it). Who are Prominent Supporters? Prominent supporters include Mark Zuckerberg, Elon Musk and Nobel winning economist Angus Deaton. [vi] Warren Buffet supports a related program, the negative income tax, originally popularized by Milton Friedman. What are the Chief Points of Contention? Proponents argue that UBI will reduce inequality, direct money to where it is needed most because the person with the need is the best decision maker, avoid the bad incentives created by traditional welfare programs, distribute more money because the administrative overhead costs are less, encourage dynamism and risk taking in the economy, and offer an additional safety net for those who are seeing downward wage pressure from automation/globalization. As UBI has never been implemented (unless you count the extremely generous payments Gulf States make to their citizens), we do not have a true case study to stress test the arguments for and against it. The pilot schemes that are/will be tried in Canada, the United States, Finland, Scotland, Kenya, and the Netherlands will take years to report their findings. We do, however, have the results from numerous experiments looking at the impact of unconditional direct cash transfers to poor households (i.e. no-strings transfers to cover basic needs for a period, but that weren’t universal or long term), both in the developed and developing world. These include five experiments in the US and Canada conducted in the 1970s, as well as over 50 experiments in the developing world. Findings from these studies are regularly employed in debates on UBI. These studies show an improvement in recipient economic conditions and wellbeing, a modest decrease in work effort, and a tendency for recipients to spend the transfers productively. However, the usefulness of most of these studies is limited by the fact that the transfers ended after a short time period (2-3 years) and were only awarded to very poor households (not universal) – the studies were structured this way because they were more focused on testing unconditional cash transfers, rather than something closer to UBI. And the richest data comes from the developing world, so it is not clear how much can be extrapolated from the behavior of transfer recipients previously earning less than $1.5 a day with citizens living in more prosperous economies. Positive effects on economic and general wellbeing. Treated households enjoyed better physical and mental health, educational performance, and homeownership rates. A modest reduction in work effort. Primary earners worked about 5-10% less and were unemployed for longer stretches of time. The reduction in working hours was much larger for secondary and tertiary earners (15-30%), who devoted more time to child care and education. No decline, or an increase, in hours worked, greater employment participation, and improved employment outcomes. In the cases where hours worked declined, the attribution showed the reduction to be mainly in the elderly and dependents. An increase in savings and investment, with recipient households investing a portion of the proceeds in income generating goods (livestock, agricultural productive assets etc.). Some studies also found that incomes after the transfers had ceased were higher than when they began. No noticeable increase, and frequently a decline, in consumption towards “temptation goods” (e.g. alcohol, tobacco). A generalimprovement in health, education, and female empowerment indicators, as well as a notable decline in child labor. What would UBI cost if implemented in the US? Below we take a rough cut at estimating how much it would cost to implement UBI in the United States. We first look at what it would cost to pay every American citizen the current poverty threshold ($12,000 a year– an amount less than half what the Swiss proposed implementing in 2016). This would end up costing ~ $3.8 trillion (or 21% of GDP and 78% of all tax revenues and contributions for government social insurance). We next look at how much of this expenditure could be funded through scrapping existing social programs and replacing them with a UBI (as some proponents argue). We first imagine the highly unlikely scenario in which all social spending (excluding infrastructure spending and education, but includes almost all other government transfers to households including healthcare) is scrapped. This would free up about ~ 92% of the funds needed to implement UBI. We subsequently imagine that only income support programs (disability, retirement & social security, welfare, and unemployment benefits) are axed. This would yield ~ 37% of the required funding. Finally, excluding social security, retirement and disability from the list of replaceable programs leaves only 11% of the costs for a UBI of $12,000 covered through replacing existing components of the welfare state. Finally, we imagine two scenarios in which the payouts of UBI are reduced depending on the income level of the receipt. For instance, in the first scenario, every $ of income earned will reduce UBI by 10 cents, meaning that if you make $120,000 you will not receive a basic income, and if you make $60,000 you will receive only half (i.e. $6000). While this is technically not a Universal Basic Income, it may offer a compromise solution between securing the underlying goals of UBI and the constraints/concerns surrounding financing it. As you can see below, this reduces the cost of implementing UBI significantly. 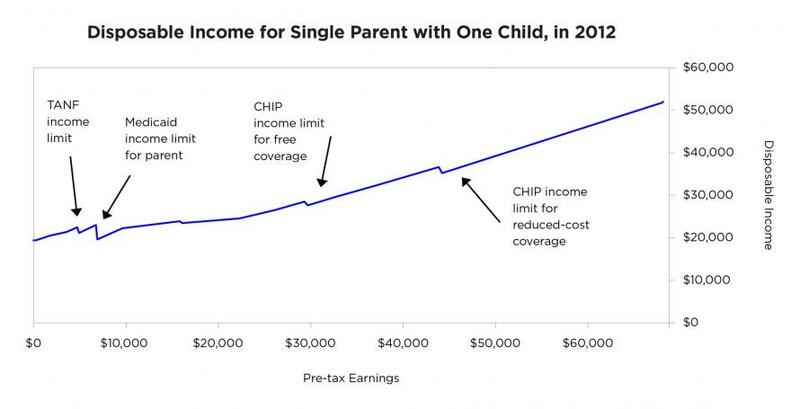 However, even using a steep slope, existing income support programs will fall short of fully financing UBI - and additional revenues will likely need to be raised. As perspective, the chart below shows OECD estimates for how much money would be made available per person if developed economies replaced all social spending ex-health care with a Universal Basic Income (purchasing power adjusted). Even the most generous welfare states would struggle to cover the cost of a poverty-line basic income. Not to say it isn’t possible – just that incremental change in our social/taxation systems wouldn’t get you there. Reducing Inequality: UBI is seen as a means to reduce inequality, which has risen in developed countries. Proponents argue that it will help compensate for 3 decades of low wage growth, increase the bargaining power of labor relative to capital, and act as a non-intrusive, and potentially less politically toxic, form of redistribution. Directing Money to Where it is Needed Most: Traditional welfare transfers typically come with restrictions as to how the money can be spent (e.g. foods stamps). This means that administrators and policy makers end up having to make choices for individuals as to where income support would be most impactful in their lives and apply such direction across the board, with limited ability to tailor to individual circumstances. In contrast, UBI empowers the individual to decide how best to use the income transfer given their particular circumstances and needs. 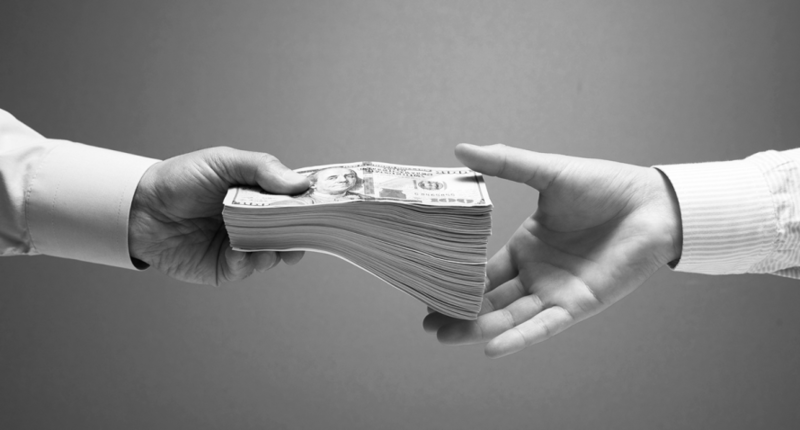 Minimizing Bad Incentives: UBI offers better incentives than more traditional welfare policies. Unlike unemployment benefits or income support, there is no disincentive against seeking better paying employment (as UBI will not be cut off as income rises – see appendix 1 for an illustration). Unlike the minimum wage, UBI should not make a set of workers prohibitively expensive for employers. Supporting Economic Dynamism: UBI could support economic dynamism and innovation through encouraging people to take more risks, lowering the entry costs for entrepreneurship/accessing productivity enhancing skills, and encouraging workers to take the time to seek work better suited to their interests, aptitudes, and sense of fulfillment. Distribute More Money By Reducing Administrative & Overhead Costs: UBI is also seen as a means to reduce/replace the large, bureaucratic, and inefficient welfare state with a simpler, more efficient, and less politically controversial safety net. This will reduce administrative and overhead costs, meaning that more money is actually distributed to those who need it as a percent of the welfare budget. Combatting the Rise of Anti-Establishment and Populist Politics: The threat of anti-establishment politics has led some to advocate for UBI as a means of updating capitalism and sharing its spoils more equitably. Compensating for Unpaid Work:Many socially valuable roles are not formally compensated in a market economy (e.g. raising a child)and are predominantly performed by women. UBI is seen as a means to begin to recognize, in monetary form, such roles, and rectify resulting imbalances in power, especially in the third world. Providing More Effective International Aid: Currently 700 million people live below the global poverty line ($1.9/day). Calculations from the World Bank and Brookings Institute approximate that it would take $80 billion in direct cash transfers to life these individuals above the global poverty line. This is almost half of what we currently spend on international aid (OECD’s budget alone is over $130 billion, not including private donations). Being Prohibitively Expensive: Opponents argue that implementing any meaningful universal basic income will be prohibitively expensive and unsustainable. For instance, the Swiss proposal of awarding each citizen about $2700 a month would cost about 25% of GDP. Critics further argue that the tax hikes necessary to adequately fund UBI will likely be a significant drag on growth. We go through some numbers for the US above. Reducing Work Ethic: Conservative critics argue that UBI will significantly reduce incentives to work and encourage people to work fewer hours and have longer stints in unemployment. Redistributing Money Away From Those Who Need It Most: Depending on how it’s done, UBI might act as a net transfer away from people currently on welfare receipts to those who already have jobs. While raising taxes to pay for UBI will likely lead to a net transfer away from the wealthiest, it might simultaneously reduce support to those who need it most. Redistributing Money Away from Providing What is Most Needed to Bad or Less Good Usage: Unconditional cash transfers would mean that policy makers cannot try to ensure that the money provided is spent towards providing essentials (e.g. food stamps, social spending) versus less impactful or even harmful uses (e.g. people spending the transfers on “temptation goods” such as alcohol and tobacco). Distracting From Improving The Existing Welfare State: Some liberal critics have argued that UBI is a distraction from the more pressing issue of improving the existing welfare state. Critics are concerned that UBI might undermine funding and support for improving tried and tested programs that took decades to set up. The chart below shows the effective after tax and transfer income of Americans earning up to 70k. There are several ‘cliffs’: points at which earning a bit more actually hurts you because you lose eligibility for a social program. FiveThirtyEight - What Would Happen If We Just Gave People Money? The Journal of Socio-Economics - A failure to communicate: what (if anything) can we learn from the negative income tax experiments?